Arsenal manager, Arsene Wenger has refused to speculate on who should become England Manager, preferring to leave the problem with the FA. The Frenchman strayed away from commenting on Fabio Capello‘s controversial departure and would not be drawn on his suggestions for a replacement. 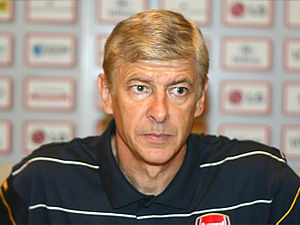 Wenger also ruled himself out of contention, saying he has always preffered being a club manager. Last Saturday, Arsenal re-discovered some form with a seven-one demolishing of Blackburn Rovers. The game included a hatrick (three goals) from in form striker Robin Van Persie and two from young english winge Alex Oxlade-Chamberlain. Arsenal have had to contend with multiple defensive injuries over the christmas period, with Bacary Sagna, Thomas Vermaelan, Kieren Gibbs amongst the absentees. The Arsenal manager feels his team are approaching a pivotal period in their season, beginning with Saturday’s encounter with Premier League form team Sunderland. Arsenal are currently 6th in the premier league with 24 points, Sunderland sit seven points back in 8th.